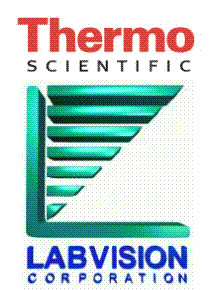 LabVision, now part of Thermo Fisher Scientific, was founded in 1994 as an employee-owned biotech manufacturing company and acquired by Sybron International in August 2000. Located in Fremont, California (USA), LabVision is situated in the epicenter of high-tech and biotechnology. We focus on state-of-the-art automation and reagents to meet customer needs. LabVision's acquisition of NEOMARKERS in 2002 strengthened our ability to meet the needs of customers. NEOMARKERS was established in the early nineties by a scientist with over 20 years of experience in cancer research. In August 2004, LabVision's parent company Apogent Technologies merged with Fisher Scientific. LabVision's ability to offer unrivaled instrumentation development, innovative histology reagent manufacturing, cutting-edge antibody product offerings, and customer/technical support that go the extra mile has made LabVision a leader in the clinical and research markets. The patented LabVision Autostainer™ has revolutionized automated immunohistochemistry (IHC). LabVision also manufactures UltraVision detection systems, synonymous with innovative IHC. These detection systems offer the latest technology and value in enzyme IHC. Made from the highest quality immunological and biochemical components, UltraVision is ideal for routinely processed surgical specimens. The systems are quick and easy to use. The UltraVision product line is a perfect compliment to NEOMARKER's antibodies and the LabVision Autostainer™. NEOMARKER's antibodies are already involved in major research studies and are available in custom configurations to fit your unique experimental designs. These include purified antibodies at a higher concentration (1mg/ml) and carrier protein-free and/or sodium azide-free formats. In addition, all antibodies are available in larger quantities for special research projects. Lab Vision and NEOMARKERS are both ISO13485 and ISO9001 certified companies with over 50 distributors worldwide.